It is becoming more common for our customers to request a glazed finish to give their cabinets an aged and well worn look. In the example below, we have a French Vanilla tinted lacquer on the left and the same finish with a Van Dyke Brown glaze on the right. This has a subtle effect on the simple shaker door style and would be much more pronounced on a door style with more detail. 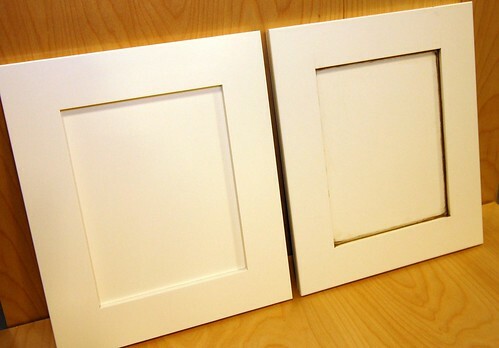 More commonly, we apply glazed finishes to emphasize the detail in stained wood doors . 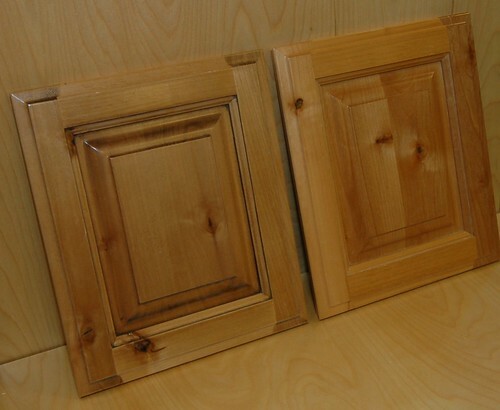 In the example below, we have identical knotty alder raised panel doors, both with a clear satin finish. The door on the left has a Van Dyke Brown glaze to emphasize the doors detail and give it an aged look.